In the natural environment, Siberian sturgeon feed mainly on small worms, crustaceans and small molluscs. 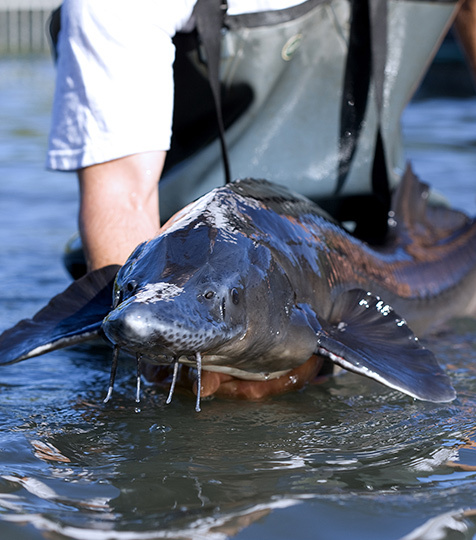 In breeding, our sturgeons are fed with granules composed of fish meal and oils, plants, minerals and vitamins. These fish meals and oils come from sustainable and quota-managed fisheries. The granules are adapted to the needs and size of the fish, from 300μ at birth to 9 mm for females. The amount of food distributed is calculated daily according to the water temperature, weight and appetite of the fish. We are constantly seeking to adapt feed to the specific needs of fish with research laboratories and feed producers. For their well-being, females of caviar production age are raised at low densities of 2-3 kg /m2 in ponds or in ponds at 30 kg/m2. In ponds, the water is naturally heated by the sun and oxygen is provided by the algae that grow in these large bodies of water. Fish farms are supplied with excellent quality water and are generally located close to the source. The water discharged is regularly monitored and complies with environmental standards.